After a 4.6 billion mile journey through the chase, the vehicle NASA's EPOXI spacecraft successfully moved toward comet Hartley 2 and send close-up image of a comet into the Earth that were recorded from a distance of 700 kilometers. 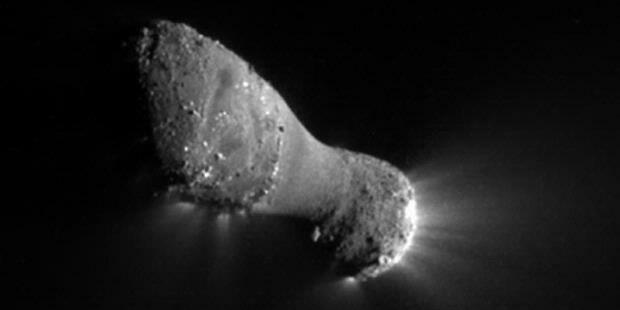 At first glance, his appearance showed that the comet Hartley 2 has a shape that has never encountered before. Comet that has a shape like a nut, the middle of a thinner and smoother separates the two parts of the polar ends or comet that is more thick and coarse. Its size is estimated with a length of 2 kilometers and threshing in the middle of 0.4 kilometers. Meanwhile, the back of the comet looks like the exhaust of combustion in jet aircraft. As comets generally, there is a tail of gas that occurs due to evaporation of the comet material (gas and dust) due to the movement of the comet approaches the Sun. "We think, form bean can be obtained since the end of the core nucleus is much evaporated. The result of evaporation it is possible to accumulate and clot in the end," said Jessica Sunshine, one of the researchers involved in analyzing the mission of this comet, as reported by National Geographic site , last week. Furthermore, Sunshine says, "In the middle of no visible activity evaporation at all." Sunshine speculated, the center of the fine is the part that is filled by the evaporation of material generated in the polar comet comet. The result of evaporation and dust are attracted to the center of the comet due to gravity.